Oscar pundit types are saying Steven Price's music for "Gravity" will take the gold this Sunday night when the Academy hands out the award for Best Original Score. Price won the Critics Choice Award which is often a big tip off of what's to come. On the other hand, Price lost the Golden Globe to Alex Ebert's "All Is Lost" - an apt title when you consider how the Academy has ignored the Robert Redford film. Some of you know I'm a Desplat groupie - check out this gushing post or this one so you can already guess I think the talented Mr. Desplat deserves the win. Desplat has been nominated five times previously, for The Queen, The Curious Case of Benjamin Button, Fantastic Mr. Fox, The King's Speech and Argo. That's five times in the last seven years and the man has yet to win. It's time people! 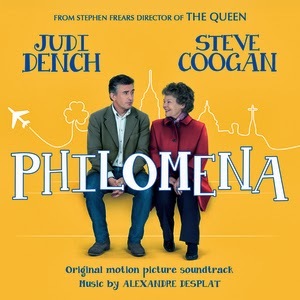 I'll be posting music from the other nominees later - check the links above for updates and for now give a listen to the main theme from Philomena.